Rolling mills for rolling of steel differ in many aspects with each other. The rolling mills are of different sizes and capacities. The mills roll steel materials of different cross-sections, sizes and qualities and in material conditions which are either hot or cold. The mills have different configurations and speeds of rolling. The configurations of the mills can vary from cross country, reversing, semi continuous to continuous. The equipments of rolling mills can have manual operations, mechanical operations, electro-mechanical operations, pneumatic operations, hydraulic operations, or a combination of all of these. The controls provided in the mills can be manual controls, remote controls, instrumented controls, or fully automated controls. Further in many types of mills even heat treatment processes are integrated. In spite of the so many differences, all the rolling mills have in common some basic technologies and equipments. All the rolling mills have rolls for the rolling of materials which are fitted in roll stands. Rolls are either driven by electric power or friction driven and are to resist many forces for normal rolling. The roll stands can have two rolls, three rolls, four rolls, six rolls, or a set of multiple rolls mounted on them depending on the types of mills. During rolling, the load on the rolls gets transferred to the roll neck bearings and their assembly (chocks). Rolls for their smooth rotation as well as for resistance to different forces need ‘bearings’. Roll bearings are to meet the basic need of the rolling mill which is the smooth rolling of the steel products. They are friction reducing devices which provide support to the rolls for effective rolling with minimum of energy loss. The bearings are designed to withstand high rolling loads, heavy shocks, varying speeds, and high temperatures. Apart from this, bearings are designed to endure ingress of scale, dirt, and water. They play important role in reducing the power consumption and improving the rolling condition. Roll bearings are required to withstand heavy loads and high speed rotations as well as severe operating environments. These bearings, especially which are used in the process of hot rolling, are often used under severe conditions, high temperatures with possibilities of intrusion of foreign materials. These bearings are to endure these severe conditions. Bearings used in rolling mills are designed to take extreme abuse from the environment in which they operate. Over time, the operating conditions and maintenance practices can change. This can have detrimental effects on operating bearings and other components. Roll neck bearings need proper lubrication for the enhancement of the overall efficiency. Proper lubrication of the bearings not only increases the bearing life but also reduces frictional and energy losses. Different types of bearings for rolls are used in different types of rolling mills for the meeting of the specific requirements of the mills. Some types of bearings need substantial capital investment but low recurring expenditures while other types of bearings need low capital investments and substantial recurring expenditures. 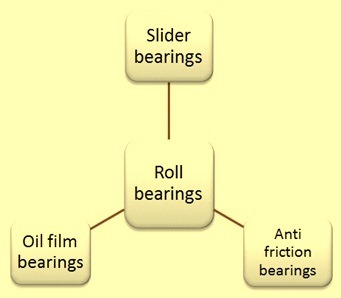 There are the three basic types of bearings (Fig 1) which are used in different rolling mills. These are (i) slider bearings, (ii) anti frictional bearings, and (iii) oil film bearings or hydrodynamic bearings. Slider bearings are plain bearings which are low in capital costs but have high intensity of recurring expenditure. They are normally used in rolling mills of low capacities having a large amount of manual operations. These bearings are usually suitable for the high temperatures and pressures which are generally encountered in these mills. These bearings are cheaper. Slider bearings have (i) high co-efficient of friction, (ii) relatively high starting and running torque because of high friction, (iii) higher power consumption in the rolling mill, and (iv) variation in size and shape. The life of these bearings is rather limited and the bearings need frequent changing. Because of low life, the rolling mill has less hot hours due to more wear and tear/breakage in the mill. These bearings are generally classified into two categories namely (i) slider bearings with metallic bush, and (ii) non-metallic bush bearings. Slider bearings with metallic bush – These bearings have high co-efficient of friction and comparatively low life. The most popular slider bearing with metal bush which is normally used in low capacity rolling mills is the gun metal bearings. Gun metal provides a relatively cheap and easy to machine material, having good bearing properties and capable of withstanding high loads. Gun metal has a good strength and good corrosion resistance. It is easy to cast a gun metal. It typically contains 85 % copper, 5 % tin, 5 % lead and 5 % zinc. Non-metallic bush bearings – These are slider bearings which use fabric base moulded section. These bearings are normally preferred over the gun metal bearings. The most popular non-metallic bush bearing which is normally used in low capacity rolling mills is the fibre bearing The non-metallic bush bearings provide good bearing for rolls having considerable speed variation or where reversal of rotation can take place. The co-efficient of friction is lower in these bearings when compared with the co-efficient of friction of slider bearing with metal bush. Due to the inherent properties, fabric base moulded bush bearings have a low co-efficient of friction, low wear and tear, low maintenance costs, good impact strength, and longer life resulting in higher rate of production. These bearings can with-stand operational temperatures which are in the range of 80 deg C to 120 deg C. Beyond these temperatures fibre bearings generally get charred. Water is used as a general source for lubrication on fibre bearing. These bearings are cheaper than metallic slider bearings and have higher load carrying capacities. Fibre bearings offer better abrasion resistance and does not need machining. These bearings are of light weight and hence easy to handle. They have peculiar frictional behaviour. They are easy to slide when wet and hard to slide when dry. The anti-friction bearings are the rolling bearings in which the rolls in roll stands are supported. The bearings are subjected to high loads. The specific load is also high. In order that the bearings can reliably support the rolling forces, they need to have high load carrying capacity. On the other hand, the mounting space available for these bearings is restricted, especially in relation to the section height of the bearings. The diameter of the roll body, less a certain amount for regrinding and the wall thickness of the chock, determines the outside diameter of the bearing. Its bore corresponds to the diameter of the roll neck. If the load is very high, a compromise needs to be found between the diameter of the neck and its strength on the one hand and the section height of the bearing and its load carrying capacity on the other hand. Since the roll neck bearings are very large in a radial direction, but are subjected to only slight load in an axial direction, the available mounting space is used as far as possible for supporting the radial forces. Anti-friction bearings have a higher load carrying capacity. The radial forces are supported by roller bearings only such as cylindrical roller bearings, tapered roller bearings or spherical roller bearings. The material used for the bearing rings and rolling elements is through hardening rolling bearing steel or, in some cases, case hardening steel. The frequent replacement of rolls influences the selection of bearing type. In general, the reworking of the roll bodies is accompanied by removal of the chocks. This is a demanding exercise in the case of non-separable bearings, such as spherical roller bearings, whose inner ring is fitted tightly on the roll neck. In the case of cylindrical roller bearings, the chock can be removed together with the outer ring and roller cage from the inner ring mounted on the neck. Four-row tapered roller bearings or two spherical roller bearings arranged together on a cylindrical neck have a loose fit. As a result, the chocks can be easily removed. Their field of application is restricted, however, by the loose fit. If cylindrical roller bearings are fitted as radial bearings, the rolls are to be axially supported in an additional axial bearing. The separate support of the radial and axial forces is particularly advantageous where the axial guidance accuracy has an influence on the dimensional stability of the rolled stock, for example in stands for rolling of shape sections. Axial bearings give very high guidance accuracy, since they can be fitted with very small axial internal clearance or even without clearance. In contrast, radial bearings used to provide both axial and radial guidance always have a larger axial internal clearance. The ratio between the axial internal clearance and the radial internal clearance is at its largest in the case of spherical roller bearings. The values are smaller in four-row tapered roller bearings. The ratio is even smaller in the case of angular contact ball bearings. There are several types of antifriction bearings. Some of them are described below. Cylindrical roller bearings – These bearings have the highest load carrying capacity for a given mounting space. These roller bearings are suitable for very high radial loads and, due to the low friction value, for very high speeds. Cylindrical roller bearings of different designs are normally fitted in roll stands. The design considered in the individual case depends on the type of application. These bearings are mainly used with a tight inner ring fit. In some applications, these bearings with a loose inner ring fit have also proved effective. The cylindrical roller bearings are normally designed with through-drilled rollers and pin-type cages, in order to accommodate the maximum possible number of rollers in the bearing and achieve a high load carrying capacity. The pin-type cage comprises cage rings which laterally retain the pins passing through the centre of the rollers. This cage has very high strength. This is particularly important in the case of bearings in large stands which are subjected to strong acceleration and deceleration such as existing in operation of reversing mills. Cylindrical roller bearings with a pre-ground inner ring raceway are often selected and finish ground together with the roll surface when the inner ring is mounted with a tight fit on the roll neck so as to achieve high running accuracy. The double- row cylindrical roller bearings are normally preferred for the bearing arrangements of work rolls. In order to reduce the stresses occurring as a result of any moments, the bearing rings are separated from each other by inner and outer spacers. In these bearings, a high load carrying capacity is less important, while it is much more important that they are suitable for high speeds. Axial bearings – In axial bearings, the chock is generally axially located in the roll stand at the operator’s end. This chock transmits the axial forces to the roll stand. Bearings of different types are used as axial bearings. The bearings used for high axial forces and moderate speeds are axial tapered roller bearings, double-row tapered roller bearings with a large contact angle, or axial spherical roller bearings. The axial tapered roller bearing has a ring fitted between the housing washers whose width is matched to the requisite axial internal clearance. Axial bearings such as axial tapered roller bearings, double-row tapered roller bearings, and axial spherical roller bearings are mostly used in the heavy mills, where considerable axial forces occur in combination with low to moderate speeds. During operation, only one bearing row is subjected to pure axial load. The other is not subjected to load. In order to prevent distorted rolling kinematics, the outer rings of the double-row tapered roller bearings and the housing washers of the axial spherical roller bearings are preloaded on both sides to a minimum load by means of springs. In rolling mills with high rolling speeds, it is no longer possible to use axial tapered roller bearings and axial spherical roller bearings. The axial bearings used in these mills are angular contact ball bearings or deep groove ball bearings. In back-up rolls for large four-high hot strip mills, a deep groove ball bearing is often sufficient as an axial bearing. It generally has the same section height as the radial cylindrical roller bearing to which it is allocated. In place of the deep groove ball bearing, a double-row tapered roller bearing with a large contact angle can be used. The requisite basic load ratings can then be achieved with a significantly smaller bearing. The double-row tapered roller bearings allow more economical designs in conjunction with considerably smaller adjacent parts. The work rolls in four-high strip mills and the rolls in two-high light-section and wire rod mills are mostly fitted with angular contact ball bearings as axial bearings. The chock arranged on the drive end is not axially located in the roll stand, but is guided on the roll neck by the axial bearing. Since the guidance forces are not very high, a deep groove ball bearing is fitted here. This only increases the width of the bearing arrangement to a small degree. It is desirable to use a deep groove ball bearing with the same section height as the radial bearing. In some roll bearing arrangements, the same axial bearing is fitted on both the drive end and the operator’s end. This gives simpler stockholding. The deep groove ball bearings and angular contact ball bearings fitted in these bearings are only required to support axial forces. In order to prevent the outer rings from transmitting any radial forces, the chocks are relief-turned by a few millimeters at the seats for the bearing outer rings. Tapered roller bearings – These bearings can support both radial and axial forces due to the inclined position of the rollers. Four-row and double-row tapered roller bearings are used in rolling mills. Tapered roller bearings are separable, unlike cylindrical roller bearings. However, it is not possible to fit the inner rings on the neck first, mount the outer rings in the chock and then slide the chock onto the roll neck. The complete bearing is to be mounted first in the chock, after which the chock together with the bearing is slid onto the neck. This means that the bearing inner ring is required to have a loose fit on the neck, although it can technically have a tight fit due to the circumferential load. With a loose fit, the inner ring inevitably creeps on the neck. The neck undergoes heating and wear in this case. Wear can be restricted by good lubrication of the fit joint between the inner ring and roll neck. In order to provide a grease reservoir and thus improve lubrication of the neck, a spiral groove is often turned in the inner ring bore. The groove also provides for collection of abraded particles. For the same reason, radial grooves are provided in the lateral faces of the inner rings. Where work rolls are supported in four-row tapered roller bearings, the low load means that little wear occurs. Furthermore, it is likely in most cases that when the regrinding material available on work rolls have been used up, the rolls must be replaced before wear of the neck has a deleterious effect. Large tapered roller bearings, like cylindrical roller bearings, are fitted with through-drilled rollers and pin-type cages. This design is necessary in reversing type stands due to the high inertia forces. Sealed multi-row tapered roller bearings – Work roll bearing arrangements in hot and cold rolling mills are to be effectively sealed against large quantity of water or roll coolant which is mixed with contaminants. The work roll bearing arrangements are normally lubricated with grease. In order to reduce costs and protect the environment, there is tendency to reduce grease consumption. Better lubrication and cleanliness at the rolling contacts can help to increase bearing life. The bearings have the same main dimensions as the unsealed bearings. High quality rolling bearing grease is used which does not escape from the bearings and is only required in small quantities. The housing seals themselves are packed with simple, cheap sealing grease. Although the integrated seals reduce the design envelope available for the rollers, leading to a lower basic load rating, the sealed bearings normally have a longer life than the unsealed bearings due to the improved cleanliness in the lubrication gap. Two-row sealed tapered roller bearings are used as axial bearings for work rolls. Spherical roller bearings – These bearings are mainly used as roll neck bearings where the demands on axial guidance accuracy are not particularly high and the speed is low. Since the available height is restricted, spherical roller bearings which have a small section height are used. These bearings are self-aligning. They can support radial and axial forces. Since the axial internal clearance is between four and six times the radial internal clearance, their axial guidance accuracy is low. Spherical roller bearings can be used at low and moderate speeds. The rolling speed is usually around 12 m/sec or less. Due to the self-alignment facility of the bearings, the chock can be supported easily in the roll stand with inaccuracy of the roll stand and deflection of the roll neck is compensated within the bearing. Spherical roller bearings are also used in pre-stressed stands where the chocks are fixed by means of tie bars and therefore cannot freely align themselves. Where it is necessary to remove these bearing quickly and easily from the roll neck and the rolling speed is low, the inner rings can have a loose fit. As in the case of tapered roller bearings, spherical roller bearings can also have a spiral groove turned in the bearing bore to give better lubrication of the fit surfaces. Where the inner rings of spherical roller bearings have a tight fit on the roll neck, mounting and dismounting is easiest if bearings with a tapered bore are used. Mounting can be aided by means of the hydraulic method. Spherical roller bearings are also used for rolls with cantilever mounting, since they can align themselves to the considerable deflections of the rolls occurring in these cases. Due to the relatively large axial internal clearance, an additional axial bearing must be incorporated in stands used for rolling of shape sections. Oil film bearings are hydrodynamic bearings. These bearings are flood lubricated, precision journal bearings which operate on a hydro-dynamically generated film of oil. These bearings completely enclose the roll neck. The bearing surfaces are separated by a liquid film. These bearings have a low co-efficient of friction at high speeds. They have a long life and low space requirement. These are used in flat rolling in slabbing mills, hot strip mills and cold rolling mills. Oil film bearing being of hydrodynamic design distributes the bearing load over a large area with no concentration points. The film of oil on which the bearing operates has enormous load carrying capacity. Because of its continuous, unbroken nature, the film eliminates wear caused by metal-to-metal contact. This oil film is constantly maintained by the hydrodynamic action of the rotating sleeve to which a surplus of oil is presented at controlled temperatures. 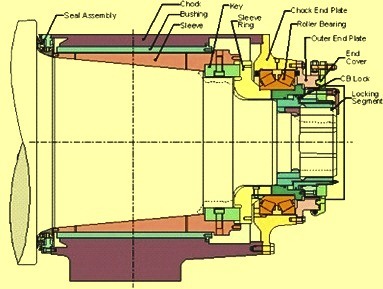 The cross section of the oil film bearing is shown in Fig 1. The principal parts of the oil film bearings are few and are of simple construction. The rotating sleeve is usually an alloy steel forging, heat treated and ground a mirror finish of around 50 micro millimeters to 100 micro millimeters. The sleeve has a taper bore which fits on and is keyed to the tapered roll neck, thus becoming the journal. The non-rotating bushing surrounds the sleeve. It consists of a steel shell lined with centrifugally cast, cadmium-nickel bearing metal, babbitt, or an aluminum alloy accurately bored to provide a highly finished bearing surface which carries the radial load. Adjacent to the outboard end of the sleeve is the thrust bearing, which is either a double-acting roller or ball bearing depending on the size of the radial bearing and can adjust itself to roll neck deflection and other types of mis-alignment common during rolling mill operations. The principal parts of the bearing along with enclosing chuck and the all-important oil and water seals and end plates make up a compact roll neck bearing. The assembly is secured to the roll neck by a lock nut engaging a split, threaded ring and is mounted and removed as a unit. Sealing encompasses more than the elastomer sealing element. It is important that all components function together as a sealing system to address the total leakage issue. The roll neck seal consists of a seal end plate, the synthetic rubber neck seal with reinforcing band, the inner seal ring and the outer seal ring. The seal rings and end plate are fastened to the chuck without the need to disassemble for normal seal renewal or bearing inspection. The inner seal ring is made of high strength aluminum alloy for reducing inertia and for providing corrosion resistance. The flexible neck seal can easily be installed and removed without disassembling the bearing. The hydrodynamic (HD) neck seal system is the most technologically sound sealing solution available. It builds on the years of sealing experience. The seal design has been developed to have high levels of its performance. The seal has been designed to maintain proper hydrodynamic seal angles through the range of its travel. Extensive computer modeling as well as full-size testing ensures the performance of the seal as per expectation. The seal is to remain effective under the difficult conditions encountered in all types of mills. Along with the selection of bearing size, the selection of lubricant is very important in case of oil film bearing. High speed mills use lighter viscosity oil. A fast tandem cold mill (TCM) may use ISO 220 cSt oil, a slower TCM may use 320 cSt oil. A slow, highly loaded hot strip mill may use ISO 680 cSt oil, where a hot mill that runs faster uses 460 cSt. A heavy reversing plate mill generally uses ISO 680 cSt oil, or ISO 460 cSt oil in a very cold climate. When selecting an oil viscosity, low speed and high speed characteristics of the bearing need to be checked. At high speed, the bearing could run at too high a temperature, requiring lighter oil. At low speed, the oil film may be too thin and heavier oil may be needed. If very slow speed continuous operation, or extended stopping under load is required, hydrostatic assist may be the solution.